Magnolia blossoms with their full, graceful petals were a popular theme for rhinoceros horn cups. 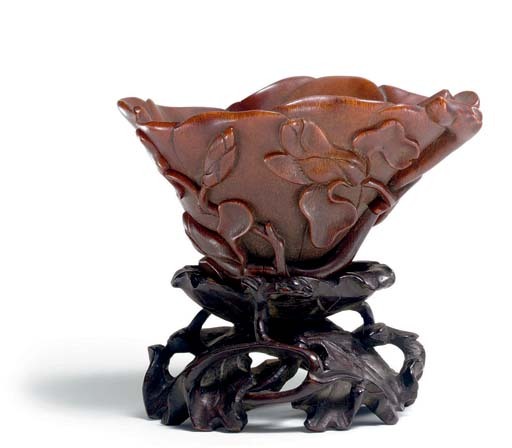 For two other similar cups, see one dated to the early Ming dynasty illustrated in The Complete Treasures of the Palace Museum - 44 - Bamboo, Wood, Ivory and Rhinoceros Horn Carvings, Hong Kong, 2002, p. 121, no. 110, and another illustrated by J. Chapman, The Art of Rhinoceros Horn Carving in China, London, 1999, p. 167, no. 211. The author notes, p. 166, that "the magnolia tree is the Chinese symbol of feminine sweetness and beauty".